In our day and age it is actually possible to over accessorize a bathroom. With so many bathroom decorations on the market, from toilet seat covers to over the toilet shelving, it is very easy to get carried away with decorating the smallest space in your home. Your bathroom design ideas should be based on one simple concept; keeping it simple. Creating a visually appealing bathroom while sustaining its functionality will create comfort for your guests and your family. A bathroom should be considered the extension of a guest room in that it should be kept clean and comfortable. Hardware options are basic concerns when designing a bathroom. Faucets and spigots, as well as tubs and toilets, manufactured in a number of shapes and materials can become the centerpiece of your bathroom. Open showers are very popular and claw-foot bathtubs are always considered to be classic and attractive. By simply choosing a certain style tub, you can create a sense of “old world” charm, or heighten your guest’s sense of modernism. Quick Tip: Evaluate privacy issues first; don’t put the toilet and tub too close together. Is it possible to design your bathroom around a favorite theme? The answer is most certainly “yes.” Keeping in mind that less is more, have fun hanging pictures and displaying unique hand towels and candles. 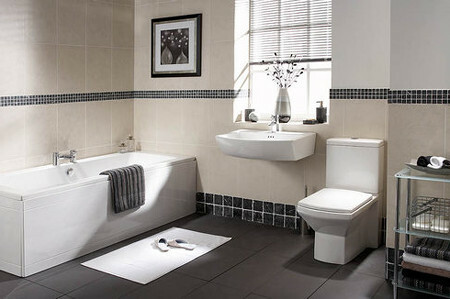 Simply remember the bathroom is a small space and should be kept clean and uncluttered. Choosing a decoration pattern that will coordinate with the rest of the home will open many design possibilities. Finding a color or pattern inspiration from your favorite artwork may be the first step toward creating a bathroom masterpiece. When designing a bathroom’s tiling, take the time to shop around through different hardware, decoration and craft stores. When choosing tile, you should look for durability, aesthetic value, and a non-porous surface. It should be easily cleaned and sanitized, and it needs to install easily without any expensive or caustic glues or cements. Be creative. The tile you choose doesn’t have to be made of porcelain. After the design and production of a space-conscious and attractive bathroom have been completed, focus on decoration accessories to bring out personality and individualism. The bathroom should be a comfortable and private room. Placing knick knacks on the walls or shelves is an interesting way to create a sense of comfort and relaxation. Even though the bathroom may be the smallest room in your home, it can still be one of the most interesting. Keep your bathroom clean, functional and simple.